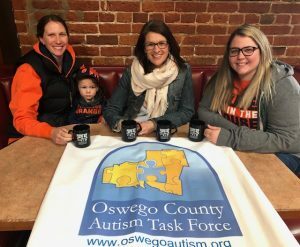 OSWEGO – The 4th annual “Out Run Autism” 5K walk/run planned for April 6 will follow with a continental “Breakfast of Autism Champions” compliments of the Press Box at the finish line; 29 E. First St.
Pictured are: Allison Canale Scanlon with Rocco Scanlon, The Press Box, Kelley Greene, event committee member, and Marissa Canale, The Press Box. The continental breakfast provided by the Press Box, a long-standing supporter of the annual event, will be available from 9 – 10 a.m. and available to all participants. The run/walk will kick off at 8:30 a.m. in front of the Press Box Restaurant taking participants through Oswego’s east side and scenic Fort Ontario. Registration is open until noon on April 4 by going to www.auyertiming.com. Limited same day registration spots will be available. Donations can also be made on the registration site.